Abstract: The fundamental purpose of Airwheel H3 motorized wheelchair is to let everyone, especially the senior citizens enjoy a free intelligent life. Let the riders experience the daily travel in an easier, freer and more comfortable way. This is Airwheel's attempt to improve the inside chip and upgrade the driving mechanism, to realize two-riding modes. Airwheel H3 has become a pioneer and rules the wheelchair market in the future, depending on its comfortable, convenient, and eco-friendly features. Airwheel H3 has adopted many new improvements, which contribute to build the new era of folding electric wheelchair. One of the most outstanding highlights of Airwheel H3 is the adopted dual ride mode. Riders now could either comfortably sit on a sadder or stand to push it go forward. The seat is wear-proof and durable. The longer you sit, the more comfortable you feel. This comfortable posture allows riders to ride for a long time without feeling boring. When it comes to the control mode, H3 differs from others. Instead of the aerospace attitude control theory, fuzzy software algorithm and gyroscope system, H3 automatic electric wheelchair installs an intelligent controller in the handlebar. Riders can control it to go forward, accelerate, decelerate, and brake, etc. by pushing the controller forward or backward and releasing it to brake. Such easy operation bears no burden on the old riders. Also, the problem of electricity blackout halfway will not happen to Airwheel H3. Branded lithium-ion battery provides H3 with a strong and stable power capacity, which satisfies the need of a daily trip. Also, with the BMS, its reliable charge and discharge technology not only provides 8-circuit protection, but also enhances the efficiency of charge and discharge. Security is guaranteed. 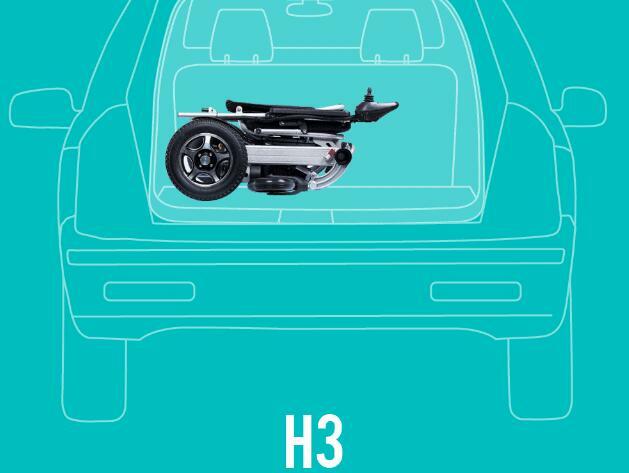 Portability is a key point of H3 to be better integrated into the public. In daily life, most people need to put the electric scooter into trunk, take it to subway or in a smaller space to ride. So, Airwheel team not only ensure the performance and riding comfort, but also make the H3 foldable electric wheelchair smaller and lighter. There is an automatic folding button in the handlebar controller. Push it and H3 will be folded or extended automatically. Next：Walking my dog on an Airwheel! Happy National Dog Day 2017!